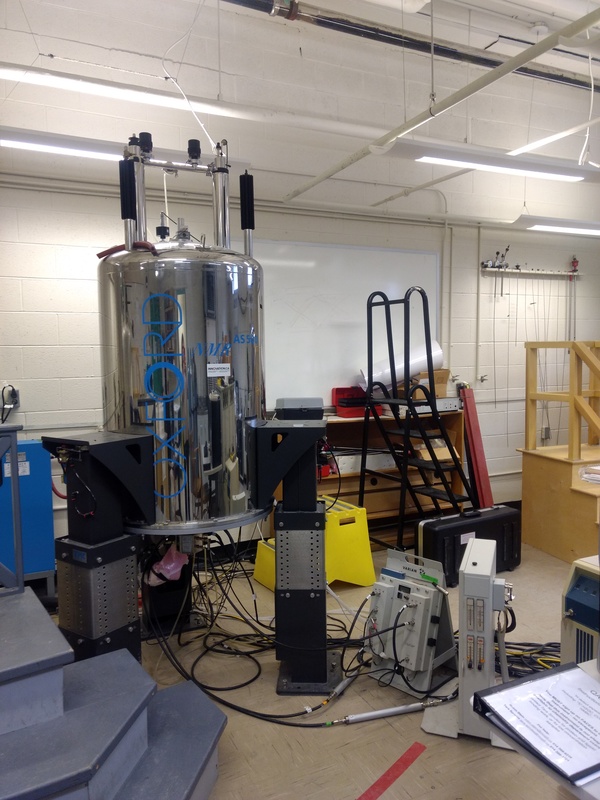 These spectrometers are both set up to run 1D and 2D experiments using 1H, 19F, 13C, 31P, and 11B experiments. Both have a 5 mm BBFO+ SmartProbe which autotunes to 1H on one channel and X (between 109Ag and 19F) on the other channel and which has single z gradient capability. Software is TopSpin 3.5. On the Bruker 500, each user may use the instrument for one hour during the day and three hours overnight. Click here for the Status page for the Bruker 500. 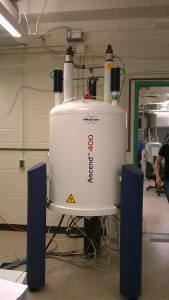 Click here for the Scheduling page (group is MCGILLNMR) and Status page for the Bruker 400. 500 MHz Varian VNMRS (room 34): This three channel spectrometer is primarily used to run directly detected 13C and 1H 1D experiment and 2D inverse detection experiments. With extra training, you can run other nuclei (such as 31P), on it. VT range for the standard probe used on this instrument (the observe, or X-optimized, SW probe): -100 to +120 C. Single z gradient capability. Available probes include: 5 mm SW PFG 1H/19F/X[15N-31P], 5 mm ID PFG 1H/19F/X[15N-31P] and an HCN triple resonance probe. Operated with VNMRJ 4.2 software. Signup (except during walkup time) can be done up to five days in advance. Total spectrometer time in the week for any user is limited to 24 hours. Any individual signup period is limited to 18 hours. If four hours or less are available between 9 AM and 7 PM, and it is less than 90 minutes before the start of the available time, you may sign up, even if you have already used 24 hours. If time between 7 PM and 9 AM is available, and it is less than two hours before the start of the available time, you may sign up, even if you have already used 24 hours. Teaching, instrument maintenance and service will have priority over other spectrometer use. 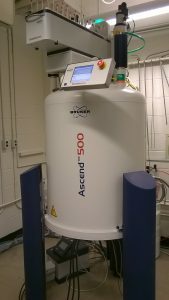 Click here for the Scheduling page (group is MCGILLNMR) for the Varian 500. 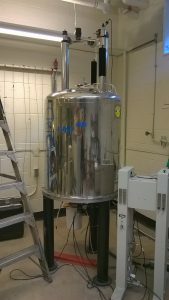 400 MHz Varian Mercury (room 37): This two-channel spectrometer is capable of observing 1H, 19F and 13C. Probe is tuned to 1H and 19F (high band) and 13C (low band). Single z gradient capability. Main probe: 5 mm Four-nucleus PFG 1H/19F/X[15N-31P]. Operated with VnmrJ 4.2 software. Additional probes include, among others: a 5 mm ID PFG 1H/19F/X[15N-31P] and a 5 mm SW 1H/19F/X[15N-31P]. Operated with VNMRJ 4.2 software. 300 MHz Varian Mercury equipped with an SMS-100 sample changer (room 34): This two channel spectrometer is capable of observing 1H, 19F and 13C. Probe is tuned to 1H and 19F (high band) and 13C (low band). Single z gradient capability. Available probe: 5 mm ATB PFG 1H/X[15N-31P]. Operated with VnmrJ 4.2 software. 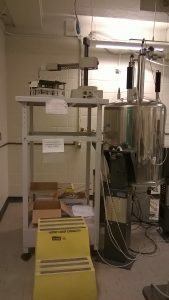 QANUC 500 MHz Varian INOVA spectrometer (room 37). 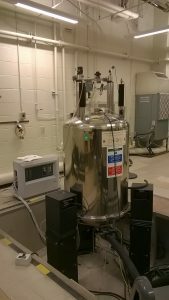 This three channel instrument is mainly used by the QANUC facility for protein and ligand binding experiments, but the Chemistry NMR/EPR Facility has some access to it, particularly during weekdays (mainly Tuesday-Friday). Click here for the Scheduling page (group is MCGILLNMR) for the QANUC 500.